Hedy Epstein is an 80-year-old Holocaust survivor who tours the country giving speeches at universities and to nonprofit groups. Her scheduled appearance at UC Berkeley's Student Union building on October 19, 2004 hardly seemed like the kind of event to stir up controversy. But as soon as her visit was announced, waves of outrage and fears of an ideological confrontation echoed across campus. Why? In addition to her early history surviving the Holocaust, Hedy Epstein is more recently a member of the International Solidarity Movement, a group of activists who travel to the West Bank and the Gaza Strip and do everything possible to "disrupt" Israel's activities there. ISM's detractors claim that the group willingly takes orders from Palestinian militants dedicated to the destruction of Israel, and that ISM members who (usually illegally) infiltrate conflict areas act as enemy combatants against the Jewish state. ISM supporters claim the group merely uses nonviolent tactics to stop the Israeli Defense Forces from harassing and attacking Palestinians. Recently, ISM's efforts have been focused on the "wall," the defensive barrier Israel is building to keep suicide bombers out of the country. So, was Epstein coming to the Berkeley campus to lecture on the Holocaust -- or on her ISM experiences? This is where the controversy comes in: She was to lecture on both topics simultaneously. 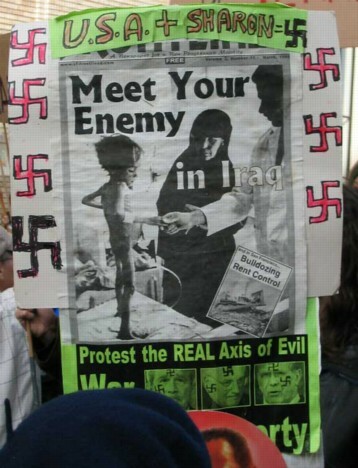 In fact, according to a flyer advertising her appearance which had been posted around campus, she planned to compare the Israelis' treatment of the Palestinians with the Nazis' treatment of the Jews. Jewish groups on campus were especially offended by this flyer, which juxtaposed pictures of Nazis with pictures of Israeli soldiers, along with text that implied the two were similar. I was, unfortunately, unable to obtain one of these flyers, and they are not available online, but Epstein was giving the same speech at Stanford University the following day, and the calendar listing for that event, containing the exact same inflammatory text, can be found here. The flyer read, in part, "She will describe how the situation on the ground in Palestine today very much resembles the situation in Nazi Germany in 1939 and will compare the egregious violations of human rights that are taking place in Palestine today as a result of the Israeli occupation to the Holocaust." The flyer had been produced by UC Berkeley's Muslim Students Association, which sponsored the event. Epstein later disavowed any knowledge of the flyer, saying that the MSA was entirely responsible for its imagery and design. Two days before the lecture, Epstein gave a speech at a mosque (scroll down to October 17th for the event listing) entitled "Surviving the Holocaust: Witnessing History Repeated" that was apparently on the same theme: that the Holocaust was being "repeated" in Palestine. And the day after her Stanford appearance, she was to head down to UC Santa Cruz to reiterate once again her accusations against Israel. Such charges and comparisons are commonplace among far-left and militant Islamic groups (see examples here, here, here, here and here), but for a Jewish survivor of Nazi atrocities to compare Israel with Hitler's Germany was something else altogether. How could she do such a thing? Epstein's success as a speaker derives from two attributes that render her immune from criticism: first, she's a Holocaust survivor, and survivors hold an almost inviolable place of respect in the Jewish community; and second, at 80 years old she's quite elderly, and frequently claims to have "forgotten" making certain controversial statements. Put these two attributes together and you've got a formidable social armor. Perhaps the most remarkable aspect of the evening was the silence: despite the audience being evenly divided between Epstein supporters and detractors, with members of Hillel sitting nearly shoulder-to-shoulder with members of the Muslim Students Association, and even ISM activists just a few feet from soldiers in the Israeli Defense Forces, no one said a word. Everyone politely clapped when she took the podium, and listened attentively when she spoke. There were no interruptions, no arguments or fights in the audience -- an atmosphere of total civility and respect. Compare that to the reception that Muslim students gave to Daniel Pipes when he spoke on campus eight months earlier. Even the potentially rancorous question-and-answer session afterward (see video clips below) was surprisingly civil. Epstein began her talk with a cursory recounting of her childhood in 1930s Germany: the Nazis' rise to power, the growing anti-Semitism. Yet, by her own admission, as the young daughter of well-off Jewish parents, she was understandably ignorant of politics and paid little attention to what the grownups were saying. An incident at school awoke her to the political realities: as she described it, one of her teachers, who came to work in a full SS uniform, pointed a gun at her in class because she was Jewish. She then went on to say that, in 1938, her parents had the opportunity to escape to British-controlled Palestine, but altruistically refused to do so because "they were firm anti-Zionists who didn't want to take land away from Arabs" and that the creation of Israel "could only lead to trouble" down the road. Epstein had only just begun her talk and I was already starting to get suspicious. I later asked experts on 1930s Germany about Epstein's supposed recollections, and was told that SS officers rarely if ever worked as teachers, that if they did they certainly didn't wear their military uniforms to school, that it was inconceivable for a teacher to pull a gun on a student in a German school, whatever the circumstances, that very very few Jews in 1938 were granted permission to emigrate to British-controlled Palestine, and that no one ever turned down that opportunity because of some naive political philosophy. While I fully accept that Hedy Epstein did in fact grow up in Germany during the 1930s, I quickly came to feel that she has over the years come to exaggerate certain details and alter facts of her personal history in order to bolster her current political stance. Epstein later admitted that she merely "believes" her parents must have been anti-Zionists -- probably because it's now convenient to believe so. But this trait of hers made me wary of accepting her descriptions of later events at face value as well. After touching on the rest of her story -- traveling on the Kindertransport exodus of Jewish children from Germany to England, her parents' likely death in a concentration camp, and her arrival in the United States -- Epstein skipped ahead 50 years to her current political activism with the International Solidarity Movement. The rest of the evening was a detailed recounting of her recent trip to Israel and the West Bank with a group of like-minded activists. Once there, her group, along with other protesters guided by the ISM, staged an intentionally dangerous confrontation with Israeli guards at a checkpoint between Israel and the West Bank. The protesters formed a phalanx and advanced on the checkpoint, for the specific purpose of provoking a violent defensive response from the guards. Consciously leaving out the context that in similar circumstances many suicide bombers have rushed checkpoints and blown themselves up, Hedy described with mock outrage how the Israelis yelled at the activists to stay away, then fired warning shots over their heads, and eventually fired warning shots into the ground in front of the advancing group. As was bound to happen -- and as the protesters hoped would happen -- some gravel kicked up by a warning shot (which Epstein described as "shrapnel") struck one of the protesters in the leg. Having succeeded in producing their requisite martyr and proving the murderous intent of the Israelis, the protesters retreated with their wounded colleague, morally victorious. She then described their second political action, this time at a section of the "wall" being built through a sensitive area adjacent to Jerusalem. Because the district is a convoluted checkerboard of Palestinian and Israeli neighborhoods, the barrier necessarily had to take a twisting path that cut off some Palestinian areas from others. The International Solidarity Movement coordinated an aggressive confrontation featuring large numbers of Palestinians and sympathizers from around the world (including Epstein) facing off against Israeli soldiers defending the barrier. The scene rapidly degenerated into a chaotic riot after the Israelis fired tear gas at the advancing crowd. 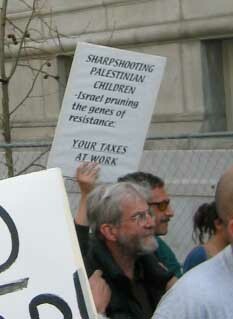 For the ISM, it was another successful day of martyrdom and Israeli barbarism. But the symbolic climax of Epstein's trip, and the most controversial part of her talk, came at the end when she was leaving the country. The airport security guards, aware of her political activities, pulled her aside for additional searching, and then stuck yellow tags on her luggage. When she asked what the tags were for, one of the guards told her that they identified her as a security risk and a potential "terrorist." Epstein then made a direct comparison between the airport security tags on her luggage (one of which she displayed to the audience) and the yellow star that the Nazis forced the Jews of Europe to wear. With that, she concluded her talk, and a moderator invited audience members to ask questions. Throughout the speech and the Q&A portion of the evening, Epstein more than once repeated the strange, lame argument that Israel is contructing its defensive barrier due to some flippant cruelty, part of a strategy to hurt and inconvenience Palestinians out of sheer spite. She also mentioned the peculiar contention (held exclusively by anti-Israel activists) that the "wall," as presently routed, serves no defensive purpose. Throughout her entire talk she made not a single mention of the barrier's sole function -- to prevent suicide attacks by Palestinians -- until at last a questioner brought up the subject. Is Hedy Epstein just a naive political idealist, being used as a tool by machiavellian manipulators? Perhaps nothing more than a forgetful old lady with an unusual hobby? Or is she something else altogether, something more sinister: someone who feigns naiveté, who pretends to be doddering, in order to render herself immune from any criticism of her extremist position? While listening to the clips, notice how she alternates between her "little old lady" persona (being deaf, having "senior moments," and making little jokes) to suddenly turning irascible and confrontational, with a quick mind and full control of her talking points. Which is the real Hedy Epstein? Each of the four QuickTime video clips below will open in a new window; it is recommended that you resize the windows so that it is possible to see each video and read its transcription at the same time, as the audio quality of the clips is somewhat low. (Or download the clips to your hard drive by right-clicking [Windows users] or control-clicking [Mac users]). An ellipsis in brackets [...] indicates an inaudible word or passage. Hedy Epstein: I have not seen-- I have not seen that. HE: I believe in freedom of -- I believe in the First Amendment. Other AM: She's trying to speak. HE: I believe in the First Amendment. We still have a little bit left of it. AM: I'm not questioning that. Other AMs: Let her speak.... Shhhh. HE: I let you speak, now may I speak? And I-- people have a right to say whatever it is they wish to say. I did not do what you think or what you read. I did not do that. HE: Okay. And that's the essence. That's the important thing. Okay? Audience Member: Honestly, honestly, I thought you were unclear. If you could make it more clear for me I'd really appreciate it. Hedy Epstein: Did I make the comparison between what is happening tonight, in my talk? Did I say -- other than when I talked about this [holding up luggage tag] and the Jewish star? Did I make a comparison between what the Nazis did and what Pal-- what Israel is doing in Palestine tonight? HE: Yeah, I guess it could only be yes or no. So did I? HE: Could you tell me, please, what I have said that came very close to it? HE: [silence] I'm-- I'm-- maybe I'm [...] I'm not talking about the flier. AM: No, I'm reading from your-- your speech. HE: I said this was-- I did make this connection [holding up luggage tag] with what the Nazis did, but I think that as far as I recall what I said and maybe sometimes I have senior moments, maybe I forgot. But I think that was the only connection I made between the Jewish star that Jews had to wear and this tag that I-- was put on everything that I own. Audience Member:I wanted to address the question that this gentleman asked about your comparison, or lack of comparison, to the Holocaust and what's going on in Israel right now. Um, I did write this down, I don't know if anyone else has it in their notes but, um, just to be clear at the-- at the end you kind of summed up with, "What was once done to the Jews was now being done by the Jews." So that [...] so I think that's the comparison. Um, [...] um, so just want to agree about that. I wanted to know, could you speak to the issue of suicide bombing towards Israel? I wanted to know what your thoughts are about that. Hedy Epstein: Um, I'm opposed to all terrorism regardless who the perpetrator is, whether that's a Palestinian or an Israeli or anybody else in the world. HE: But I also want to add this: um, that I can-- while I don't condone suicide bombing -- with every fiber of my body I'm opposed to any kind of terrorism -- suicide bombing or whatever. But at the same time I'm trying, always trying to put myself in the shoes of another person, try to understand where he or she is coming from. And, and again I want to stress I'm totally opposed to suicide bombing. But I can understand why somebody might do that. Because when everything has been taken away from them and the only decision that is left to this person who may not know whether he's going to live the next day is to decide when he or she is going to die and then straps some bombs or whatever around his or her waist and go to Israel and take with-- as he takes his life, he takes the lives of many other innocent people, women, children, et cetera. Men, women, and children. There's no others. AM: You're saying that -- all their rights are taken away by Israel? HE: Right. When he has nothing left, doesn't even know whether he's going to live to the-- until tomorrow. And so it's his last decision: "I'm going to decide when I'm going to die and how I'm going to die." In the process, unfortunately, he takes with him other innocent people. AM: You said that you, you were two-day training in anti-violence. I work in IDF three years, and all the three years they train us in anti-violence -- three years. And I want to say another thing: You say that the soldiers in uh [...] tell you that they cut you to half, because [...] in Ramallah that the terror organization takes three, ehhh, innocent of the [...] reserve and they slaughter them. They cut them to pieces. And they show it all over the world. Show me one [...] that the Israeli army did, or something they did that they go slaughter a person and show the picture of the parts in, in the television. And the fence that we talk about this will try to do-- I know because I just got back from Israel. The Israeli government [...] Ehud Barak give Arafat almost everything that he could. And instead he walks. And that, when he [walks]. The IDF is perfectly [...] from the Jew [...] the people who lived in Israel. Arafat [....] lived inside Israel. So if we wouldn't build this fence, terrorist people would be entering Israel, be shooting inside apartments [...] so we must take [...] of the fence, because the other side is not [responsible] to talk with. HE: As I said before, if Israel feels it needs a, a, a fence or a wall, it has every right to build that fence or that wall. But it has to build it on its own land. Places in A Ram that I've talked about before where in June when I was there the wall was not yet up. It is up now. It is right going down the middle of the main street in A Ram and it is not separating Palestinians from Israelis or vice versa but it's separating Palestinians from Palestinians. For instance the children that live in A Ram on one side of the wall, they can't go to their school anymore because the school is on the other side of the wall, and you know, how does that prevent, how does that produce security for Israel? When the wall separates Palestinians from Palestinians? AM: I want to talk. He tried to draw the line, Ehud Barak. And Arafat didn't accept it. That's why we now [...]. AM: I know the map. HE: And it's not contiguous. A poem Hedy Epstein wrote about Palestine. An article about Hedy Epstein's appearance at Stanford the following day (October 20, 2004).